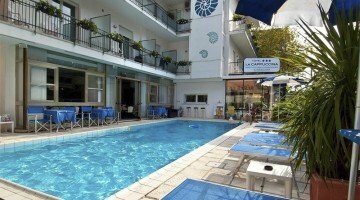 Hotel La Cappuccina is a 3-star family-run hotel in Riccione, in a quiet area with a heated swimming pool, children's facilities, themed rooms and a restaurant with vegan and gluten-free cuisine. Admits pets. The hotel is located in Riccione in a quiet area, less than 5 minutes from the beach and the city's canal port. Viale Ceccarini can be reached on foot in about ten minutes. ECONOMY: they are equipped with bathroom with shower, air conditioning, heating, safe, telephone, LCD TV, WI-FI. Those on the ground floor and the attic have a window, the others have a balcony. COMFORT: have a new renovated bathroom with shower, LCD TV, balcony, telephone, WI-FI, independent air conditioning / heating. SUPERIOR: renovated and located on the first floor of the hotel, are soundproofed and equipped with bathroom with shower, heated towel rails and hairdryer, minibar, safe, air conditioning, heating, balcony, larger beds, larger windows, 26 "LCD TV, electric shutters, WI-FI A Superior room has a hydromassage bath and chromotherapy. FAMILY-JUNIOR SUITE: more spacious than the Superior, ideal for families. Spacious from 17 to 22 square meters, they are composed of 2 separate areas and equipped with 2 LCD TVs, one of which is 32 ". A junior suite has a Jacuzzi. SHARKY: themed room with a marine setting inspired by Sharky, mascot of the Aquarium of Cattolica. ULISSE: two connecting rooms with shared bathroom inspired by the Ulysses dolphin. Swimming pool, open-air porch, sun terrace, free use of bicycles, theme nights, free shuttle service to the airport and train station. PARKING: covered and uncovered at 150 m available upon reservation for a fee. Garage 50 m by reservation and subject to availability, subject to charges. CONVENTIONS: beach, amusement parks, gym, spa, waterslide, shuttle service. Free entry to the Beach Village water park and the Perle d'Acqua Thermal Park. PETS: allowed of all sizes with supplement. BREAKFAST: buffet with sweet and savory products. LUNCH AND DINNER: local cuisine with 3-choice menu, homemade pasta and desserts. VARIATIONS: vegan and celiac cuisine. In hotel: outdoor playground area, strollers, entertainment, baby sitter, pediatrician on request. At meals: baby food , baby menu, high chairs. 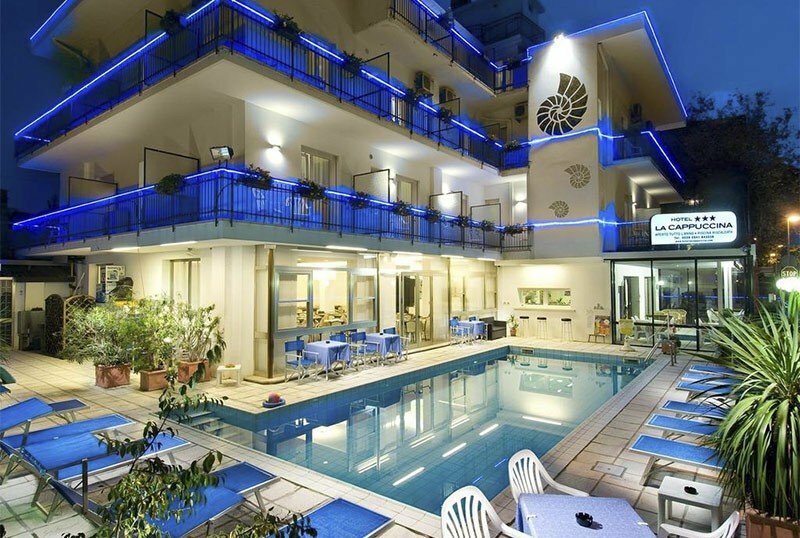 The hotel has a heated outdoor pool with depths from 120 to 140 cm, surrounded by a solarium with loungers. The hotel has an agreement with the Bagno n. 92, which offers: large playground with inflatables, professional gym, baby club, entertainment for adults and children, baby point, ping-pong table, bocce court and small library with books and magazines.